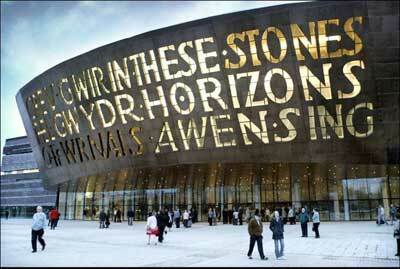 I wrote the words to reflect the cultural ambition of the Centre. They draw both on Wales's industrial past and the institution's location in Cardiff Bay, once the greatest coal port in the world. Each letter is six-foot tall and formed of stained glass, set in glass-reinforced gypsum. I wanted the words to reflect the architecture of the building. Its copper dome reminded me of the furnaces from Wales's industrial heritage and also Ceridwen's cauldron, from which the early poet Taliesin received his inspiration ('awen'). 'Awen' suggests both poetic inspiration and the general creative vision by which people and societies form their aspirations. The windows out of which the words are made suggest to me an ideal of poetry: that it should be clear enough to let light in and out of a building, offering enough a distinctively local view of the world; it should speak a truth which is transparent, beautifully crafted but also fragile and, therefore, doubly precious. It was important to me that the English words on the building should not simply be a translation of the Welsh, that they should have their own message. The strata of the slate frontage of the WMC reminded me of the horizons just beyond Penarth Head. The sea has, traditionally, been for Cardiff the means by which the Welsh export their best to the world and the route by which the world comes to Cardiff. The stones inside the theatre literally sing with opera, musicals and orchestral music, and I wanted to convey the sense of an international space created by the art of music.